Your registry’s landing page is the first point of entry for participants looking to join your registry. It should therefore provide information about your registry such as the purpose, benefits, sign-up information, and what participants need to do to participate in the registry. It should also be branded (with matching colors and images) so participants will recognize that it is a part of your organizational programming. Remember: take time to think about what the user experience will be like from the beginning to the end. After all, you want a good experience for your participants so they can continue to partner with you in the future! The PEER platform provides landing page templates that you can customize directly in PEER for Research, the administrative portal. You can customize the color scheme, message, and add a video slideshow (or what we call, features). Once you're done, you can then grab the HTML code for the landing page and easily embed it into your organization's website. You can also embed the sign up/log-in page into your website, which gives you the flexibility to create your own landing page. Registry sponsors who choose to use PEER's landing page template can list short, concise steps on how participants can participate in the registry. 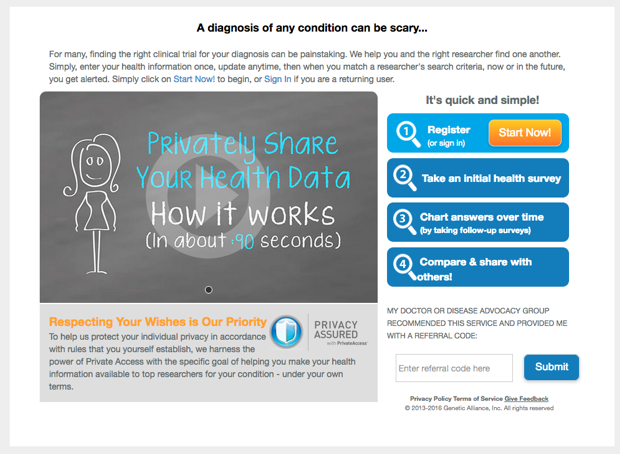 Others choose to add videos (or, features) as part of the registry landing page to communicate the value of participating in the registry from experts and members of their community. You can view examples of landing pages using these by features by looking at PXE International, and The Fibrolamellar Registry. In contrast, you have the option to create your own landing page on your organization's website about the registry, and link participants directly to the registry sign-up/log-in page. Some registry sponsors elect to do this to add more information about the benefits of participating in the registry, what the registry process will be like, and the support services available to participants. Examples of these types of landing pages are the Pancreatic Action Network and the Celiac Disease Foundation. As you can see, each registry sponsor has different levels of customization which caters to each group's unique community. Regardless of whether you choose to use the landing page template or use your own, follow the instructions below. This means that participants will see the screenshot below when you embed the landing page into your organization's website. You can choose one of our custom themes on the left-hand corner of the template, or you can create as many themes for your landing page as you want. 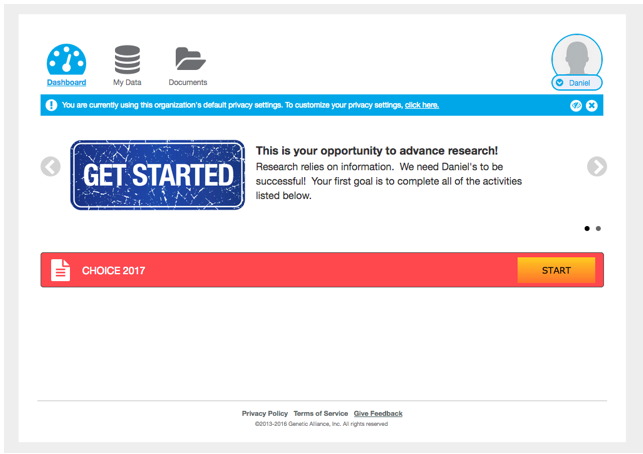 This means that you are electing to design your own registry, and the screenshot below is what participants will see when you embed the registry to your website. 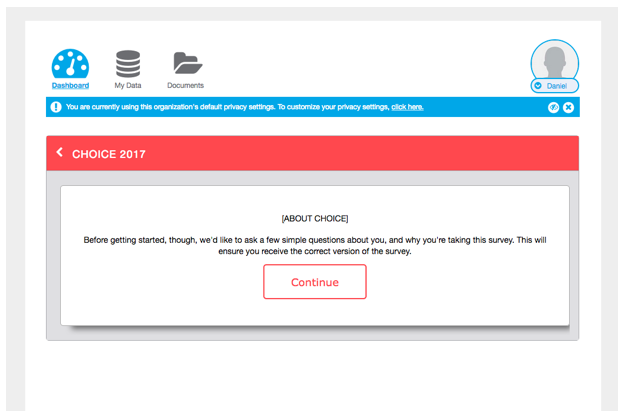 However, you will still have to choose colors for certain elements and save this as a 'theme', since the theme colors are also displayed in participant dashboards and surveys. Next, we will go over how to edit each element below, beginning with the colors. If you choose option 2, please feel free to skip the other editing sections after reviewing 'Choosing and Saving Your Theme.' Please also refer to the image below when going through the customization options. Alternatively, you can create our own theme, which means choosing your own color scheme for your links, background, buttons, and theme using the color picker. If you know the specific color code for your organization's primary colors, you can also enter in the color code in the text boxes. If you do not know the exact color code for your organization's colors, you can find the matching color here. Theme1 corresponds to the dominant color that will be used throughout your registry. This color is the color you will see as the first step in the template landing page, the participant dashboard icons, and banners. LinkRollover is another color that will be prominent throughout your registry. This color will appear as the activity bar in participant dashboards, header banners in the 'My Data' view for participants, and be the dominant banner and button colors in the surveys. Button color is the color of the buttons throughout your registry including the 'Start Now!' button on the landing page template, and the buttons participants will use to start activities on their dashboard. Be sure to click 'Save Theme' on the top right hand corner, and give your theme a name. It will then appear on the top left hand drop-down menu so you can easily select your theme. Once you are ready to push out your new or edited theme to your participants, click the 'Publish' button. If your portal is not yet live, you can view the theme from the participant-side by going to your demo portal. 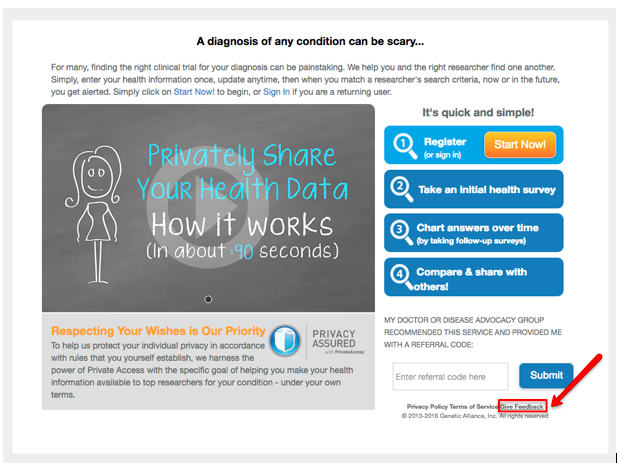 Your portal headline is essentially the 'title' of your landing page that will appear in the top center of your registry (Step 3 in the image below). You can either put your portal name or a call to action to further emphasize to participants about the importance of their contributions. Similarly, your portal introduction should provide a brief overview of what the registry entails. The content of this introduction will be based on your expertise of your audience. You can edit your portal’s intro text by clicking on the 'Click to edit' button (Step 4 in the image above). You will bring up another dialogue box. Type in your desired text or make any edits. Then click 'Okay' to save your changes. Use the checkbox to decide whether to add “Click on Start Now! to begin” at the end of your intro. If you add this text, 'Start Now!' will link out to your sign-in page. You also have the option to edit the privacy message for your portal. This is a space where you can provide a brief summary on how you plan to use the information provided in the registry, and how the information will be protected. This is a good space to mention the flexibility, dynamic, and granular settings that participants can customize once they create an account. 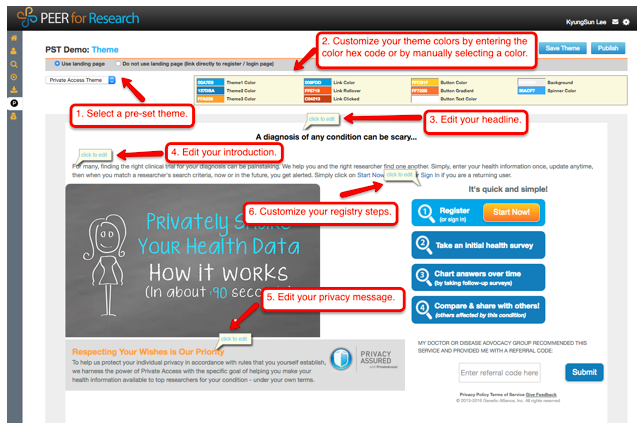 You can edit the privacy message for your portal if you’d like (Step 5 in image above). To do so, click on the last 'Click to edit' button to bring up another dialogue box. Edit the message header and text, and click 'Ok' to save your changes. The registry steps is an easy way for your participants to see an overview of what the registry process will be like from beginning to end. Refer back to the examples at the top of the section to see what other groups have listed as their steps. You can edit the text describing the steps to join your portal by editing, creating, or removing the boxes. 1. Edit the text of the header that appears above the first box. In the IBCRF example, this text is shown as “It’s Easy as 1,2,3”. 3. Edit the text within your Step 1 box. This is ALWAYS the sign-up step. In the IBCRF example, this is the text that says, “Register (or sign in)”. 4. Edit and/or remove Steps 2-3. To remove a step, click on the dropdown menu (indicated in Figure 16 below) for the step to None. 5. Add a Step 4, if desired. Select a function for this step using the dropdown menu. 5. Keep in mind that when selecting functions for your steps, the only functions that you should select from the dropdown menu are Sign-In or Sign-Up, or Message Only functions. Additional functions will become available in the future. 7. When you are done editing your steps, click 'Ok' to save. 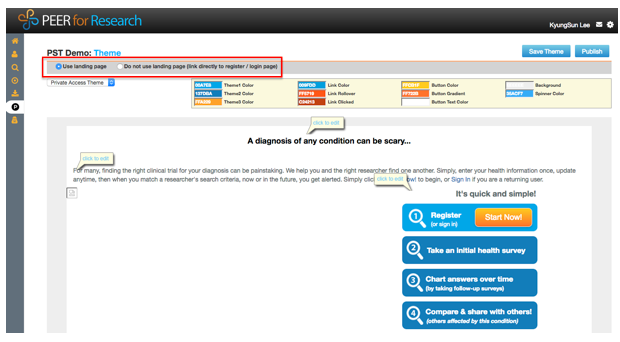 Although you cannot edit this, take note of the 'Get Feedback' link at the bottom right of the landing page. This is the link that participants can use to submit questions or issues about the registry. Our PEER team will automatically be notified of the issue and will work directly with participants to address their questions or issues. If the feedback is survey-related, the PEER team will forward the email to your primary point of contact for PEER. Alternatively, take note of the Pancreatic Cancer Action Network's landing page once more to look at their information on Patient Registry Resources. Here, they chose to list their contact information so that participants can contact them directly. Some groups elect to do this as a way of working with participants on their own, and working with the PEER team if they need additional technical assistance. Each registry comes with a set of features that you can customize in your registry. The features can be videos or images (using a video slideshow) that you can use to relay additional information about your registry. Some groups have videos of community members talking about why they decided to participate in the registry. Other groups display several promotional images about the importance of participating. All organizations using PEER are given two starter feature videos. One is the 'How It Works!' video which briefly summarizes how the registry empowers participants to have control over their privacy and sharing settings. You can view this video here. The second video is the PEER starter video explaining the importance of PEER for research. You can view this video here. When creating your own features, keep in mind that our PEER team offers feature and guide packages to assist you in creating video and community guides. You can view the prices and packages for these services [INSERT LINK here]. The following dialogue box will then appear. For each new feature, enter a feature name and upload a feature image (585 pixels wide by 353 pixels tall). 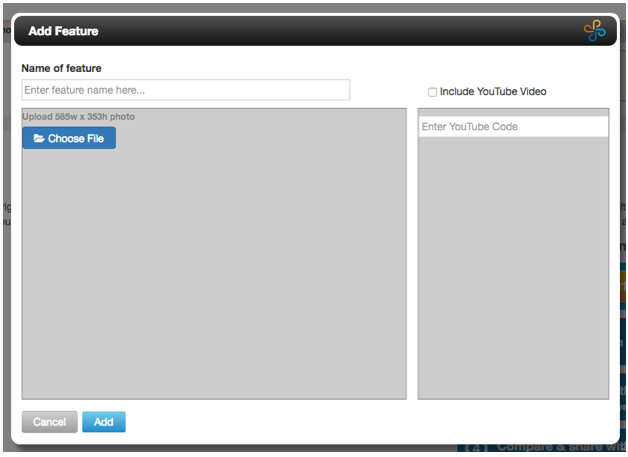 If you are using a video, select the box that says 'Include Youtube Video', and enter the Youtube code which can be found after the = at the end of the Youtube link. For example, for for this sample Youtube link: www.youtube.com/watch?v=6f7VzWzvOV3. The code is 6f7VzWzvOV3. Click 'Add' when you are done. 1. Open your 'Features' menu and search for your feature in the Search by name box. 2. When your feature appears, hold your mouse over it and click on the upward-facing arrow that appears. 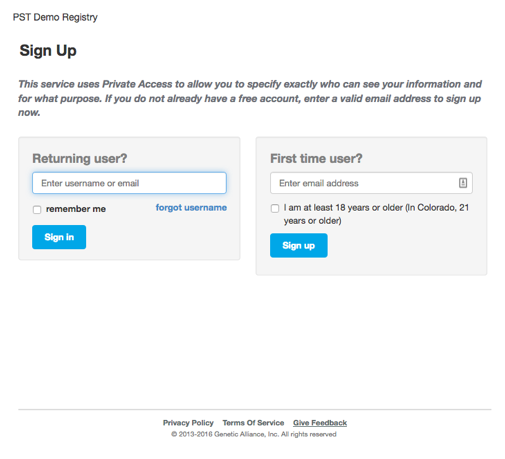 This will assign your feature to both your live and demo portals. 3. Re-order assigned features by holding your mouse over the feature you wish to move and expanding the 'Assigned Feature' Menu. Use the arrows to move the feature up or down, and delete unwanted features using the X button. 4. Keep in mind that deleting a feature will simply remove it from your portal – it will not delete it permanently. 5. You can preview your features by viewing it in your demo portal. Congratulations! You have completed the basic setup of your portal. In the next section, we will go over how to begin building out your registry content, starting with the privacy settings. To begin the "Understanding Your Privacy Settings" section, click here. Please also note that the community guide features mentioned in this section are further explained in the privacy settings section, so refer back to this current Wiki page to finish building your registry features.